NGC1365 is one of the large, showpiece galaxies of the southern skies located in the constellation of Fornax at RA 03h33m36.4s and DEC -36deg08m25s. 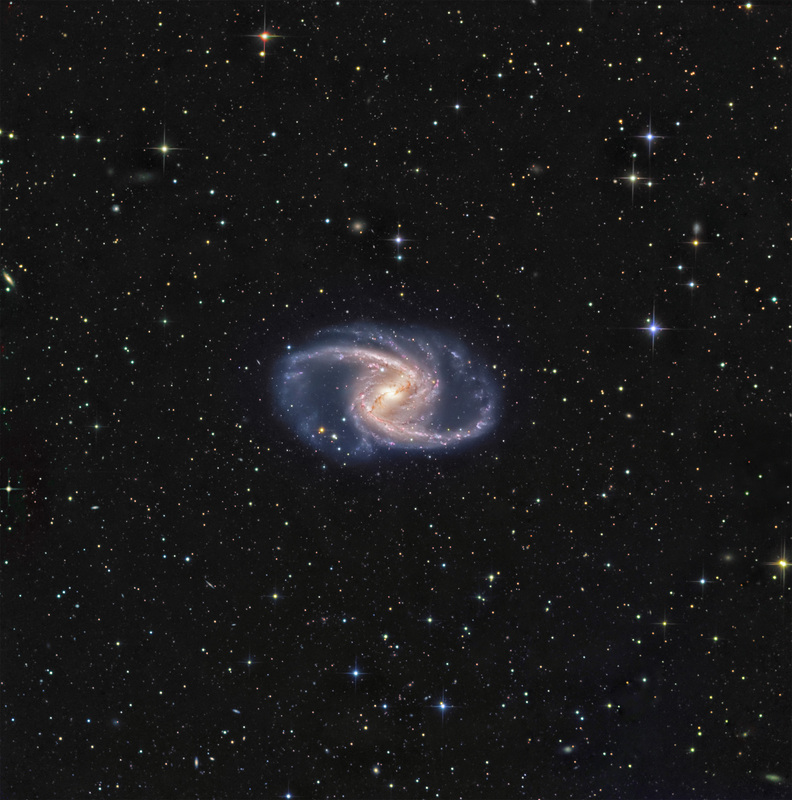 It is a barred spiral galaxy (R)’SB(s)b 56 million light years distant, bright (mag. 9.5) and huge, with a diameter of 200,000 light years and an apparent size of 11′ x6′. It is part of the Formax cluster of galaxies. The blue knots and pink HII regions in the extended spiral arms are areas of new star formation. About 50 Cepheid variable stars, used to determine galactic distances, have been found. The barred region is a massive collection of dust and gas. NGC 1365 has an active nucleus. Based upon rotation studies, NGC 1365 appears to lack a dark matter halo. Chandra has measured high energy X-Rays emanating from the core, suggesting the presence of a supermassive black hole. This image is ~ 42′ x 42′ and north is toward the upper left. Many of the small background galaxies are ~ mag 16, such as the elliptical galaxy, PGC 74714, directly above NGC 1365 near the tiny, bright blue star. Data were taken automatically with CCDAutoPilot4 running MaximDL4.62 and guided with an SBIG ST-402 on an Astrodon MonsterMOAG off-axis guider. Astrodon Generation 2 LRGB filters were used. Data processed in CCDStack and Photoshop CS. What was the single frame exposure time, and the f/no of the telescope for this image of NGC 1365? 14.5″/f8.2. I believe that each luminance frame was 15 min. and each RGB 10 min.